Many foreign media fell prey to the dramatic, well-rehearsed lies that Rappler’s Maria Ressa delivered during her speech in the US, in which she portrayed herself as a victim of legal harassment just because she is against the government and that she was God’s gift to Philippine journalism. Canada’s Foreign Minister Christia Freeland was one of the persons duped by Ressa into believing that her life in the country isn’t safe. 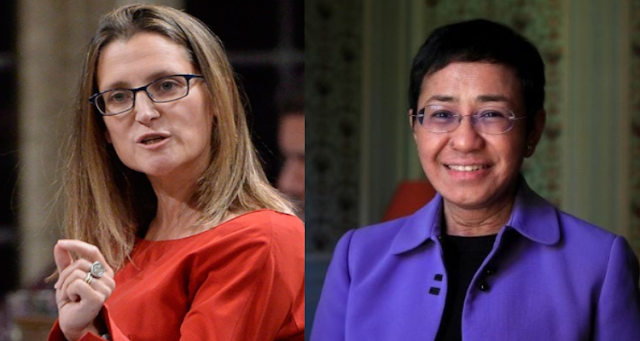 In a post she shared on Twitter, Foreign Minister Freeland expressed her concern for the safety and security of Maria Ressa. She also decried the alleged harassment of journalists in the Philippines, saying that it has no place for democracy. The foreign minister Freeland, who used to be a journalist and a writer before becoming a politician, should have verified Ressa’s outrageous claims before jumping into conclusion and hitting the Duterte administrations with her harsh comments. 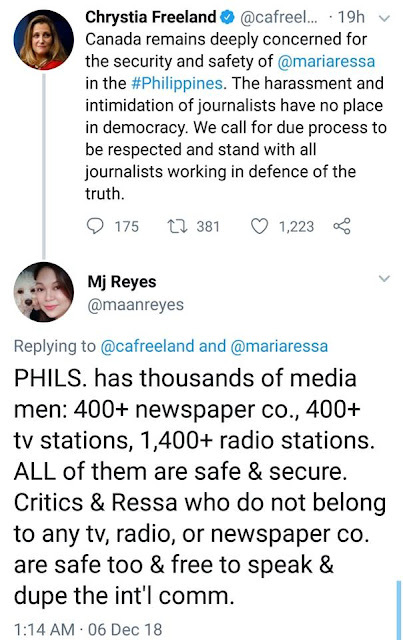 It’s unfortunate that coming from the journalism background, she did not even attempt to dig into the issue and verify the truthfulness of Ressa’s claims. Online Influencer and International Trade expert MJ Quiambao Reyes couldn’t contain herself as she felt it was unfair for the government to be accused of something just because of a pseudo-journalist. She tweeted a reply to Freeland, saying that there are thousands of media personalities on TV, Radio, and Print and that all of them are safe. Even the critics of the president, as well as Ressa herself, are safe and free to speak blatant lies to fool the international community. Lastly, she slammed the foreign minister for hastily assuming that Ressa’s claims are true without even checking on both sides. The issue was tax fraud. If Canada and other countries condemn tax evasion, why can’t the Philippines? Philippines is deeply concerned on how some people in high places have allowed themselves to be duped by a pseudo journo. We are concerned how hastily you have assumed without checking both sides and knowing the real situation. If tax evasion has no place in your and in many countries, why should it be ok in ours?